In previous blog posts we have highlighted the importance of making a habit out of reading to your baby every day, bringing special one-on-one quality time that strengthens your bond. Depending on your baby’s age, you can focus on different aspects of the reading experience, but what’s the best way to share books with a one-year-old? The American Academy of Pediatrics has created a literacy toolkit that includes great tips for parents and caregivers who wish to make the most out of reading time! 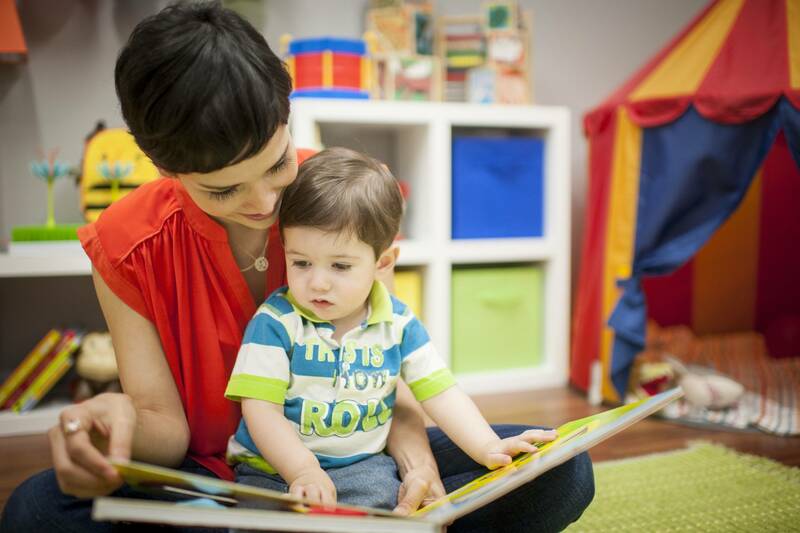 This blog post will summarize a few key points about reading with a one-year-old throughout three stages: 12–14 months, 15–17 months, and 18–24 months. Within each age range, you’ll find examples of what your child can do and what you can do to maximize the reading experience! Your child can: At this stage, your little one can probably pick a favorite book to read with you and point to pictures he wants you to look at too! Your baby will most likely explore the book, turning it upside down, opening or closing it, and even putting it in his mouth. He will try to copy your reactions while reading and pay attention for a few minutes at a time. You can: Find a quiet, cozy place to cuddle up and read together. While reading, name and point at the pictures your child is looking at or pointing to. Help him turn the pages, following his interest. Read joyfully, using different tones of voice for each character. You can also ask your child questions he can answer by pointing to things, like “Where’s the kitty?”. Also imitate your child’s sounds and talk to him about the pictures in the book using short phrases. Your child can: At this stage, your youngster can pick a favorite book to read with you, look at familiar pictures, and make sounds for some of them, like the different animals. While reading, your little one will pay attention for a few minutes at a time and laugh, squeal, and point while enjoying reading time with you. You can: Find a quiet, cozy place to cuddle up and read together. Let your little one choose which book he wants to read with you, even if it’s the same from last time (and the last before that!). While reading, name and point at the pictures your child is looking at or pointing to. Read joyfully, using different tones of voice for each character, and copy the sounds or words he says while looking at a picture, adding a few more words to complete a phrase. You can also name and demonstrate actions or emotions that show up in books, like smiling. You can say “Look at the girl smiling” and then smile to your toddler. Your child can: At this stage, your little one can pick the book he wants to share with you and point at familiar pictures, saying a word or two about it. If the book includes animals, your child will probably imitate their sounds. Also, if you are reading a book that is very familiar, your little one will be able to finish some sentences such as: “Twinkle, twinkle little …. (star)”. This is also a good age to enjoy a trip to the local library for story time or to find new books! You can: Find a quiet, cozy place to cuddle up and read together. Reading time can become a way to calm and comfort your child, especially if it’s part of your nighttime routine. Let him choose which book he wants to read with you, even if it’s the same one from last time (and the last before that!). Help your toddler understand the story by speaking slowly and in short sentences. Read joyfully, using different tones of voice for each character, and copy the sounds or words he says while looking at a picture, adding a few more words to complete a phrase. You can also pretend to be characters from the book, acting as babies, puppies, or whatever you’re reading about! Read the Books Build Connections Toolkit from the American Academy of Pediatrics to get more information about the benefits of reading at all ages and a few resources you can use to help you along the way. Find a quiet, cozy place where you and your child can cuddle up and read together. Reading time can become a way to calm and comfort your child, especially if it’s part of your nighttime routine.